Teenagers are now at greatest risk. Teens have a death rate twice that of younger children and account for half of all child pedestrian deaths. Research Report: Pedestrian Safety and Teens (2013) What kids told us. 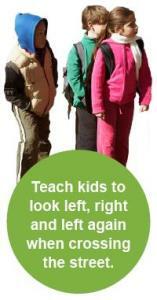 Pedestrian Safety Tips (PDF): Download what you need to know to keep your kids safe while walking. Spanish Pedestrian Safety Tips (PDF): Descarga lo que necesita saber para mantener a sus hijos seguros mientras caminan.